Matilda Joslyn Gage. Photo courtesy of the Library of Congress. 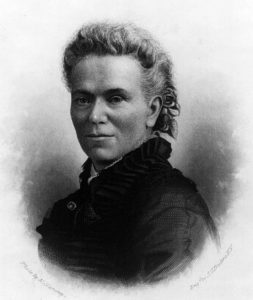 A lifelong women’s rights advocate, author, and friend of Susan B. Anthony and Elizabeth Cady Stanton, Matilda Joslyn Gage was born to physician Hezekiah and Helen Leslie in Cicero, New York. The daughter of a nationally known abolitionist, she was raised in a household dedicated to eradicating slavery and grew up in a home that was a station on the Underground Railroad. Through her father’s teaching, Matilda had become proficient in Greek, physiology and mathematics, and was enrolled in the Clinton New York Liberal Institute. She later married Henry Gage and moved to Fayetteville, New York, where they raised five children. She began her life’s work as a champion for women’s rights at the annual National Woman’s Rights Convention in Syracuse in 1852, four years after the first convention in Seneca Falls. Working closely with Stanton and Anthony, she helped establish the National Woman Suffrage Association (NWSA) and served in various influential roles from 1869 until 1889. When Anthony was arrested in 1872 for voting in the presidential election, Gage remained loyal to her friend, spoke out on her behalf, and wrote an analysis of the case for the Albany Law Journal. Gage helped organize both the Virginia and the New York state suffrage associations and was an officer in the New York association for 20 years. From her New York home, she published the National Citizen and Ballot Box, NWSA’s official newspaper from 1878 until 1881. In addition to publishing the NWSA’s official newspaper, Gage was a correspondent for newspapers from New York to California, primarily writing about women’s rights issues and activities. With Stanton, she co-authored the major documents of the NWSA. In 1880, under Gage’s leadership, the New York Woman Suffrage Association won the short-lived women’s rights to vote and run for office in school elections. After holding a series of organizational meetings in her home, she led more than 100 women to the polls, where an all-woman slate of officers was elected. Thirteen years later, Gage fought unsuccessfully for continued suffrage in a case testing the constitutionality of the state law that gave women the franchise in school elections. Stanton once said of Gage, “She always had a knack of rummaging through old libraries, bringing more startling facts to light than any woman I ever knew.” She documented many previously unacknowledged accomplishments of women such as Catherine Littlefield Greene’s invention of the cotton gin, wrongly attributed to Eli Whitney, and Anna Ella Carroll’s detailed planning of the crucial Tennessee Campaign of the Civil war, wrongly credited to General Grant. Throughout her life Gage published essays on a vast array of topics including how some American Indians practiced equality in political leadership. Alarmed by the religious movement to decree the U.S. a Christian nation, Gage in 1890 established the Women’s National Liberal Union to oppose uniting church and state. This created a rift with Anthony and Stanton, who did not approve. Gage’s singular solo work was Woman, Church and State(1893), which advocated that church and state should remain separate. Gage died on March 18, 1898. Her memorial in the Fayetteville cemetery carries her quote, “There is a word sweeter than Mother, Home or Heaven; that word is Liberty.” She was inducted into the National Women’s Hall of Fame in 1995. Matilda Joslyn Gage Foundation website: http://www.matildajoslyngage.org/gage-home/womens-rights-room/. Matilda Joslyn Gage Biography: www.thefamouspeople.com/profiles/matilda-joslyn-gage-6654.php.